Celebrating more than eighty-five years of the prestigious yacht company, Hinckley Yachts traverses decades, oceans, and seas, capturing the joy, excitement, and serenity of the ultimate boating experience. A highly respected name in the yachting world, Hinckley sets the standard for high quality, performance, and lasting beauty. 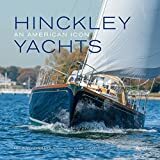 This book showcases the rich history, classic design, and legendary work of the handcrafted Hinckley yachts from 1928 to today. With historic and contemporary photographs and drawings from Hinckley's extensive archive-featuring the incredible craftsmanship and technical innovations of both its sailing yachts and jet boats-this is the first book to celebrate Hinckley's rich history. Chronicling the company's early years, which includes boats used for World War II, to its integral role in the fiberglass revolution and the evolution of today's modern yacht, it offers an in-depth look at some of the most legendary and renowned boats in the world. Hinckley Yachts: An American Icon is a must for any boating, yachting, or sailing enthusiast, as well as those interested in classic design and craftsmanship.